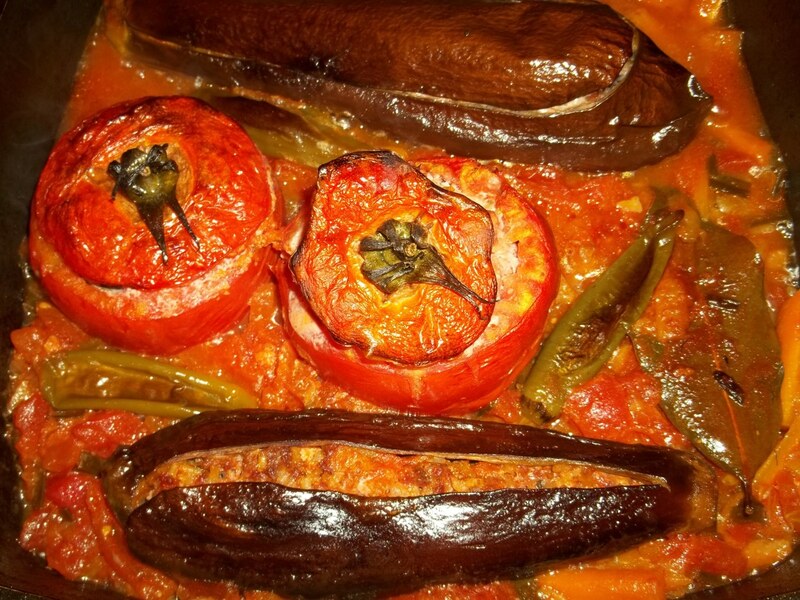 Tolma (Georgian: ტოლმა), known as Dolma in Armenia, Azerbaijan and Turkey, is a popular meal in Georgia and there are many variations. It usually describes a filled, hollowed-out vegetable or a filling wrapped in a leaf. Fillings can include meat and vegetables. 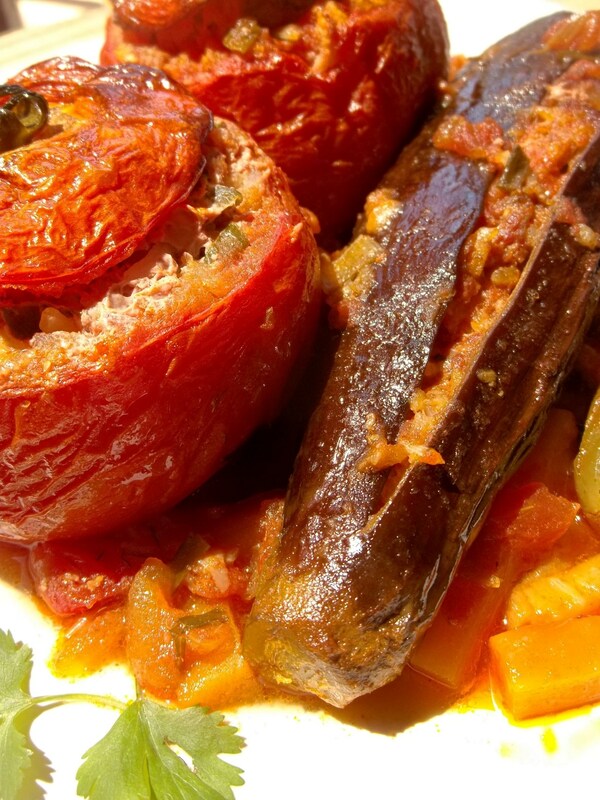 In this recipe we show how to make tolma with eggplant and tomatoes. 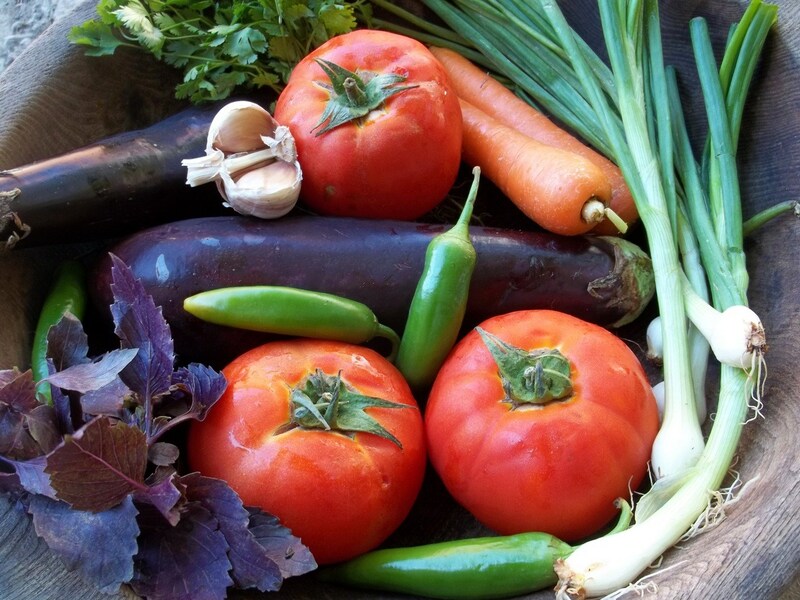 Ingredients: 2 medium to large eggplant, 3 large juicy tomatoes, 3 hot green peppers, 5 large green onions, 6 cloves of garlic, 20 grams of basil, 20 grams of fresh green coriander and 2 carrots. 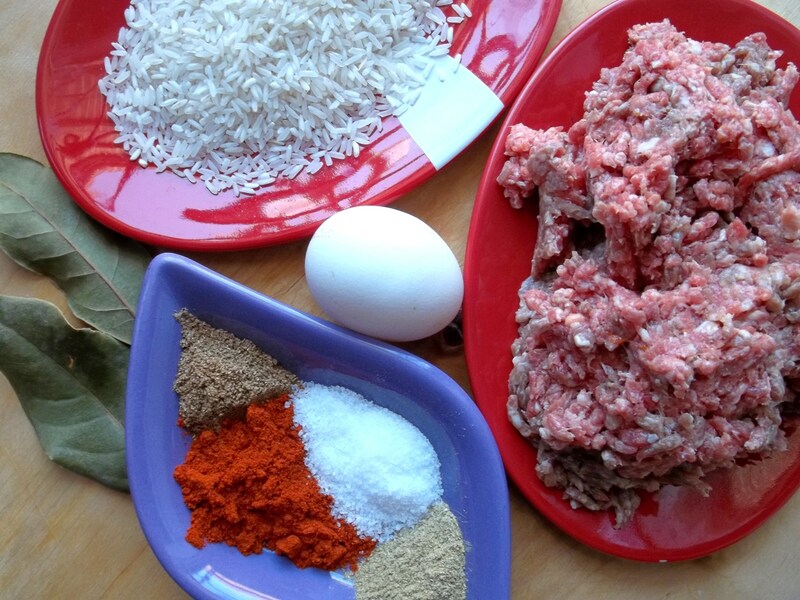 400 grams of minced beef/pork mix, 80 grams of rice, 1 egg, 2 bay leaves, 1 tbs of hot red pepper, 1 tsp of coriander, 1 tsp of blue fenugreek, 70 ml of oil, and salt (amount dependent upon personal preference). 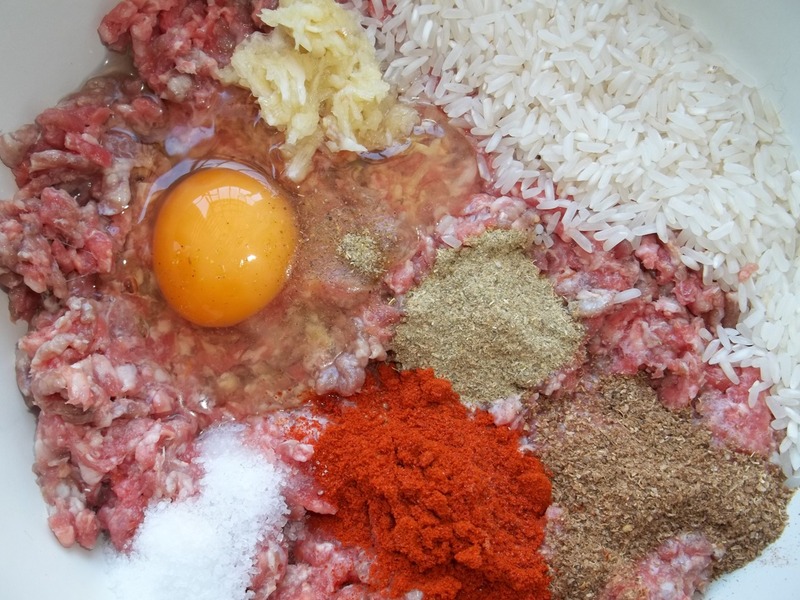 Preparation (filling): Add the minced beef/pork to a mixing bowl. Crush 3 cloves of garlic and add, together with the rice, 1 egg, 1 tbs of hot red pepper, 1 tsp of coriander, 1 tsp of blue fenugreek, and salt. Mix thoroughly. Chop the basil, green coriander and green onions. 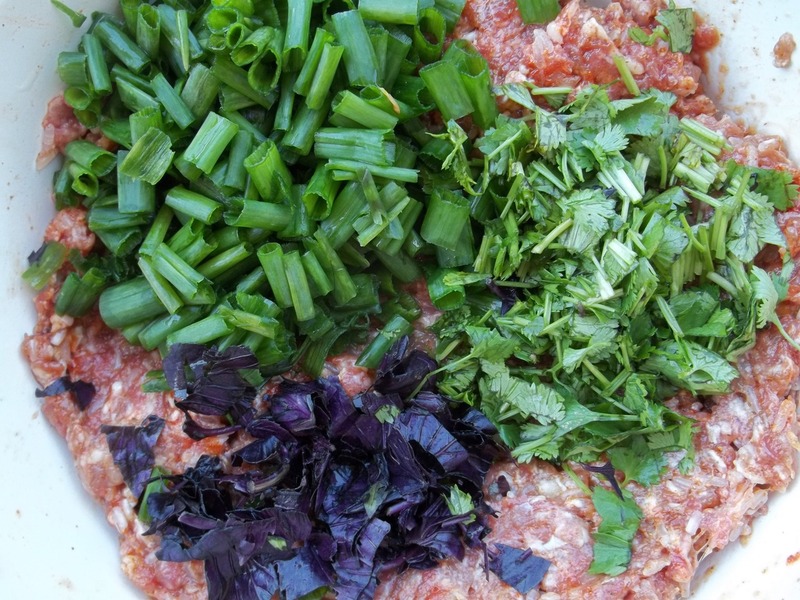 Add one third of the green onions to the mixing bowl, together with the chopped basil and green coriander. Mix thoroughly. 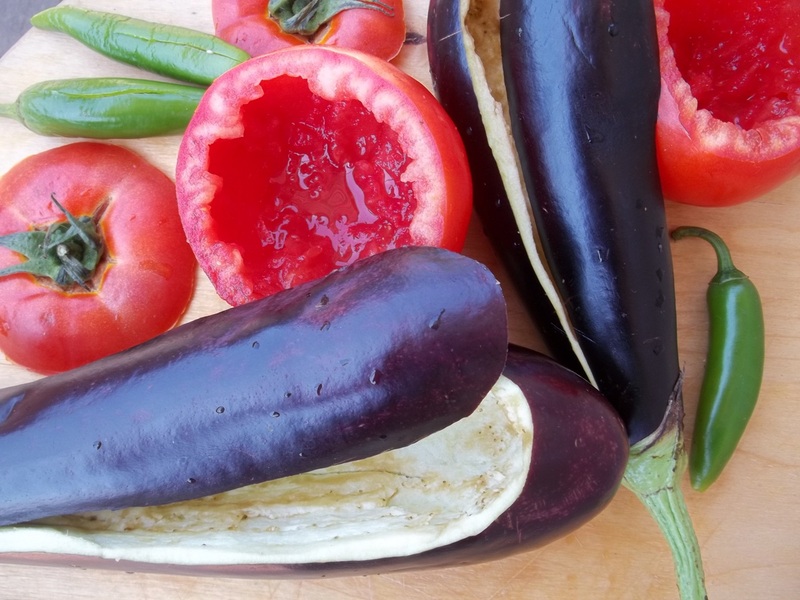 Preparation (sauce): Scoop out the insides of the eggplants and 2 of the tomatoes. Do not discard. Chop the carrots. Add 70 ml of oil to a large pan. 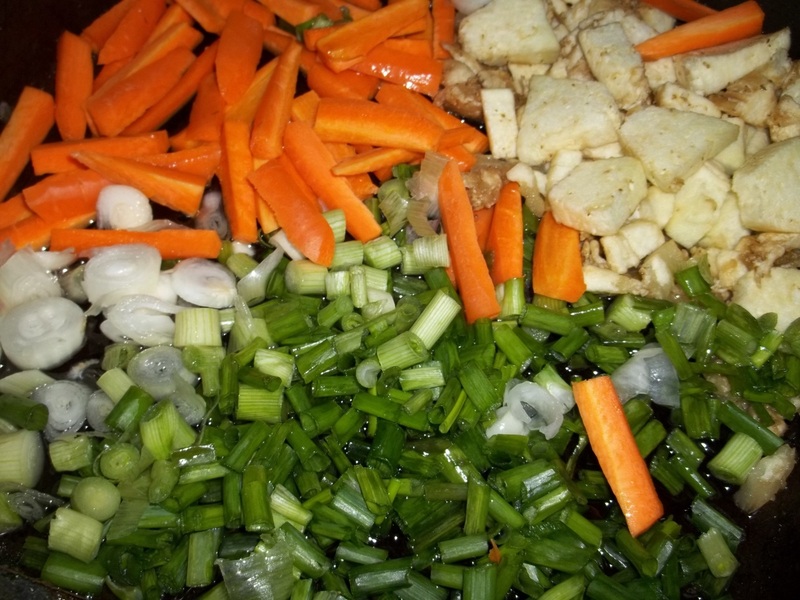 Add the chopped carrots to the pan, together with the pulp of the eggplants and the remainder of the chopped green onions. Fry, uncovered, on a medium heat for 7-8 minutes, stirring frequently. Chop the remain tomato. Crush 3 cloves of garlic. 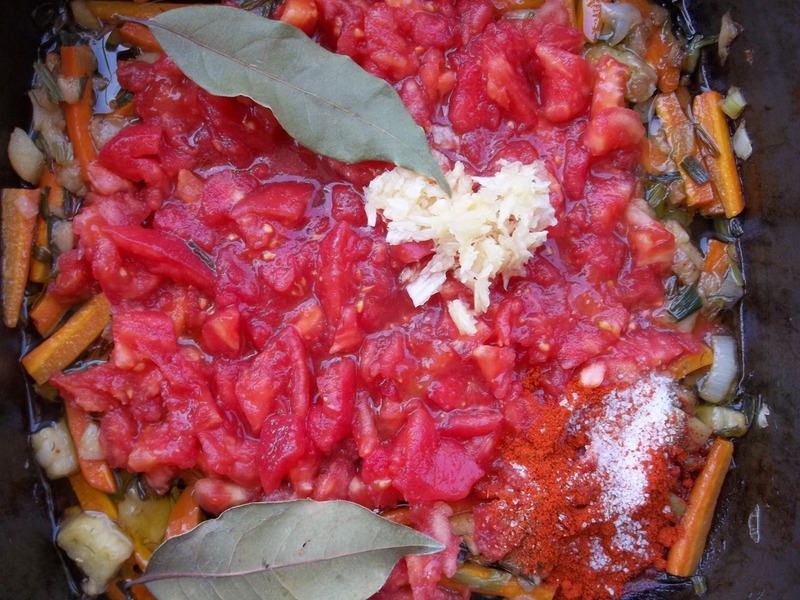 Add the chopped tomato and crushed garlic to the pan, together with the tomato pulp removed earlier and 2 bay leaves. Stir and cook on a low temperature for 5 minutes. If the tomatoes are not juicy, add up to 200 ml of water. 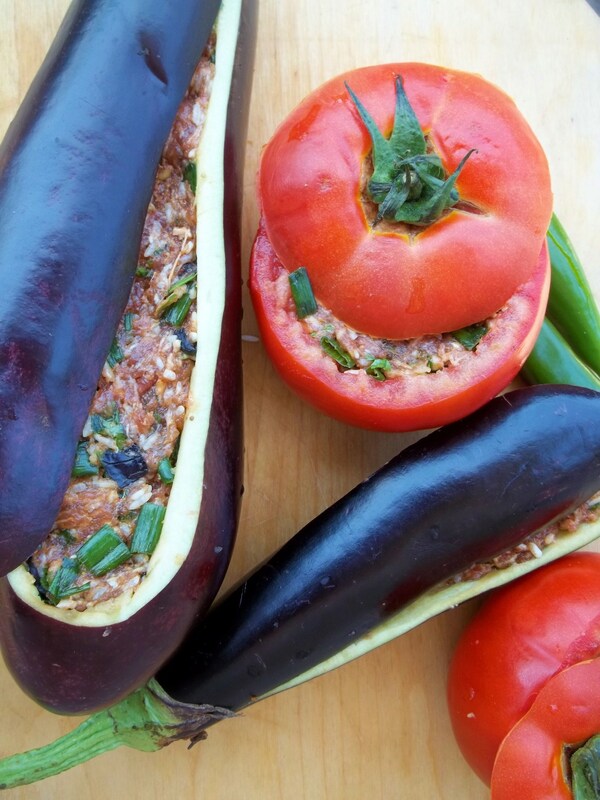 Fill the eggplants and tomatoes with the meat and rice mixture prepared earlier. Press the mixture firmly into the vegetables. 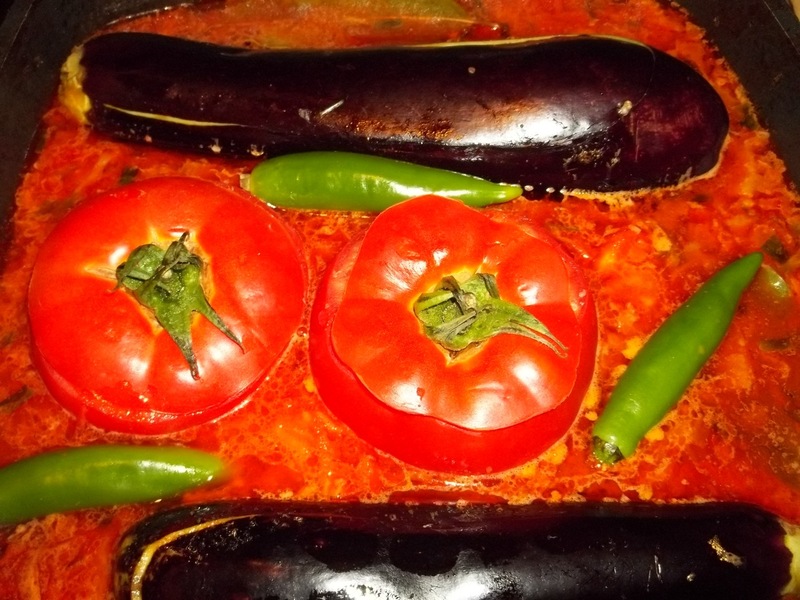 Slit the hot green peppers and add, together with the filled eggplants and tomatoes, to the pan containing the sauce. Cook in the oven for 1 hour at 200 C.
Serving: Serve hot. In Georgia it is often served with sour cream or Matsoni. 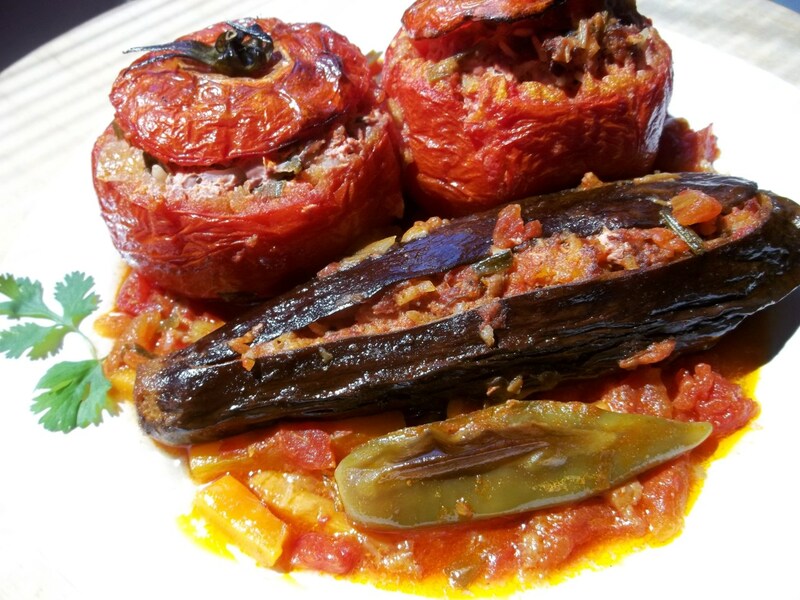 Enjoy your Stuffed Eggplant and Tomato!